张坦, 张昌民, 瞿建华, 朱锐, 袁瑞, 潘进, 陶金雨. 准噶尔盆地玛湖凹陷百口泉组相对湖平面升降规律研究[J]. 沉积学报, 2018, 36(4): 684-694. ZHANG Tan, ZHANG ChangMin, QU JianHua, ZHU Rui, YUAN Rui, PAN Jin, TAO JinYu. A Research on Relative Lacustrine Level Changes of the Lower Triassic Baikouquan Formation in Mahu Sag of Junggar Basin[J]. ACTA SEDIMENTOLOGICA SINCA, 2018, 36(4): 684-694. Abstract: The Triassic Baikouquan Formation in Junggar Basin has not been clear about the characteristics of relative lake level changes, which restricts the analysis of their distribution and evolution of the sediments. 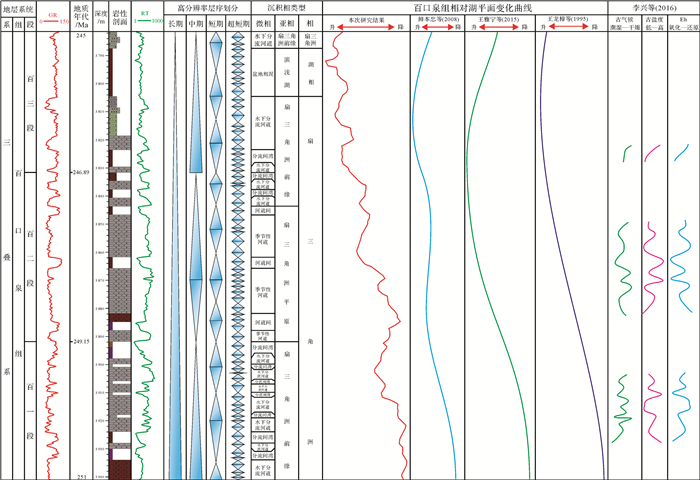 This formation can be divided into one long-term sequence cycle, four mid-sequence cycles, 16 short-term sequence cycles, 126 super short-term sequence cycles on the high-resolution sequence stratigraphic division method combined with traditional qualitative analysis and quantitative logging wavelet transform analysis, under the guidance of high-resolution sequence stratigraphy theory, comprehensive drilling, logging and other information. The 126 super short-term sequence cycles were Fisher plots. Analysis of the Fisher plots shows the characteristics of relative lacustrine level changes. The Baikouquan Formation relative lacustrine level change is a continuous lacustrine transgression process.T1b1, T1b2 and T1b3, respectively, corresponds to a large-scale lacustrine transgression process, and each the large lacustrine transgression process contains several times of the lake level rise and fall cycle, and at T1b3 lake level reached the largest area. Compared with previous results and drilling geological information, we find that the lake curve has high reliability. Cross T A, Lessenger M A. Sediment volume partitioning:rationale for stratigraphic model evaluation and high-resolution stratigraphic correlation[J]. Predictive High Resolution Sequence Stratigraphy:Norwegian Petroleum Society, Special Publication, 1998, 8: 171-196. Cross T A. High-resolution stratigraphic correlation from the perspective of base-level cycles and sediment accommodation[C]//Proceedings of Northwestern Europian Sequence Stratigraphy Congress. 1994: 105-123. Wright V P, Marriott S B. The sequence stratigraphy of fluvial depositional systems:the role of floodplain sediment storage[J]. Sedimentary Geology, 1993, 86(3/4): 203-210. Fischer A G. The Lofer cyclothems of the alpine Triassic[J]. Kansas Geological Survey Bulletin, 1964, 169(1): 107-149. Sadler P M, Osleger D A, Montanez I P. On the labeling, length, and objective basis of Fischer plots[J]. Journal of Sedimentary Petrology, 1993, 63(3): 360-368.